I just wanted to say that I really enjoyed reading Michael Bunkers book SURVIVING OFF OFF-GRID. If you have considered or are thinking about living off-grid, then you must read this book. Michael believes that off-grid living is a good first step, but that the real goal should be to live off off-grid, where you do not depend on the world grid system to provide your needs, you should strive to use your land and provide as much as possible for your needs as, he says God intended for man to live. Again it is a great book, it will really get you thinking. There is a book I am reading right now that is excellent. Michael Bunkers book called Surviving Off Off-Grid. I am almost half way through and it is one of the better books I have read. 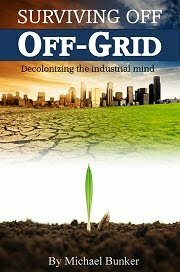 This book is not just about getting off the electrical grid, but goes deeper by getting you off your off grid system to the ways that were done before electricity. Judging from the direction the world is headed we will need some of those skills again. I really recommend you buy this book! let me know what you think.